We stock our inventory, and custom laser engrave, in Plain City Ohio, on the north-west quadrant of Columbus Ohio. Most items have a standard 3 day production time, and we are able to customize and ship your order same-day, if needed. We combine advanced production systems to efficiently and cost-effectively meet needs of corporate marketing departments, advertising agencies, universities, manufacturers/assemblers and others with a need for quality aluminum promotional items including custom carabiners and carabiner keychains with various options to choose from in quantities of 500 to 500,000 +. For all engraved orders we create a fast free eProof for you to review — if you wish, even before placing and producing your order. We do not charge for general art and design, and also do not charge for design revisions. Our carabiner keychains and other products are engraved with state-of-the-art Fiber lasers. Fiber lasers are advanced, crisp and powerful lasers for promotional product engraving that feature a finer "hit" area for unsurpassed sharpness and quality, delivering a bright, sharp and clean engraving that radiates "1st Quality". As simple as an item like a carabiner, for instance, may seem, there are multiple things that make one type or style perform better than another. All shapes available in all sizes offered — and at the same price point. We also offer Round and Bar Shape Options. Furthermore, since carabiners have 2 engraveable sides we make it easy — and economical — to double your advertising and get the most publicity for your promotion dollar. Second side engraving is available for only 10¢ each. Great to advertise your company name on one side, and your Web address on the other. Writing and living these are two different things. Since 2004, we have been working with these core values as our over-arching principles of guidance. 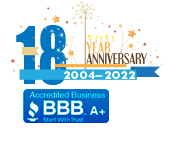 We are truly proud of our highest possible rating with the BBB and remain as committed today to these values as ever. We are vigilant about the quality of the materials our promotional items are made with. At Wholesale-carabiners.com, we don't just say our products are quality products — our products are United States Lab Certified to be lead-free with testing documentation on file. Our aluminum items have a solid, smooth feel; they are made from 6000-series aluminum, the same aluminum used in commercial jet aircraft and instrumentation construction. The quality carries on through the exceptionally sharp engravings via our fiber lasers that make your message truly stand out. We believe quality is also about excellence in customer care which we feel must be on par with every other touchstone in business. Our in-house Art Department and customer care professionals bring extensive experience working with — and transparently assisting — Advertising Agencies of all sizes to ensure you, and your client, are 100% satisfied. Our highly streamlined system and tight manufacturing controls allow us to forward even more significant savings to you — while delivering exceptional quality and consistency, fast production schedules and dedication to customer care. We can create your products with an anodizing color made to order, tailored specifically for your individual needs, based on Pantone (PMS) custom colors at no charge. Custom carabiner color minimums begin at 5000 units. In addition, custom carabiners featuring 100% unique shapes and color treatments are a specialty.